What is the Settlement Center? Our saga exhibitions and restaurant are open every day of the year from 10 a.m. - 9 p.m. We open our wellness buffet at 11:30 a.m. and menu at 12 p.m. In Egil's exhibition, there are a number of artworks by many different artists. And this terrifying statue of Kveldulf made Axel Hallkell Jóhannesson along with the employees of Sviðsmynd. 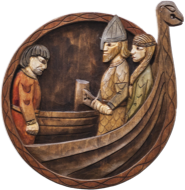 Here is the story of how the Nordic Vikings began to sail on an open ocean. The guidebook is in 15 languages plus children's guide in Icelandic. Everyday from 11:30-15 we offer a wide range of vegetarian dishes and fruits in a cold buffet with hot soup and freshly baked bread. Cup of coffee or te is included. Wellness buffet is for vegetarians, vegans and all the others. 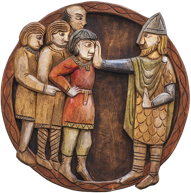 Egill, the local Viking, spent a long time in the outskirts of Gunnhildur king-in-law, and built it up to him, or as in Egil's story: "Hér set ég upp níðstöng , ok sný ek þessu níði á hönd Eiríki konungi og Gunnhildi drottningu"
Experience two award-winning exhibitions or simply relax in our friendly restaurant with a cup of coffee or a delicious meal. We are looking forward to seeing you. In two of Borgarnes’s oldest buildings The Settlement Center is devoted to recreating Iceland’s earliest days and introduces visitors to one of the best known heroes of the Icelandic Sagas, Egil Skalla-Grimsson.It also houses a cozy licensed restaurant, a café and a souvenir shop. The Center consists of three buildings, the warehouse, the merchant house and the reception hall. We've won another Certificate of Excellence! We received recognition from Vakanum! A free guided tour – on your smartphone! Make the most of your visit to Iceland by downloading our free guided tour – straight to your phone. The tour leads you from KEFLAVIK airport to REYKJAVIK and then on to the Settlement Center in BORGARNES. Have a safe journey. We look forward to seeing you! With the help of GPS navigation your smartphone guide automatically detects your location, giving you great insights into your surroundings. It’s like having your own personal guide. Get the Locatify SmartGuide at the App Store or Play Store. Look for the map of Iceland and zoom in on Keflavik Airport, then select the tour. You can also download the app at home and listen to it before you arrive. Simply choose manual instead of GPS mode.